Teach children the parts of a book: Cover-The front and back cover that protects the pages of the book, the front usually gives the title, author, and illustrator. Title Page-the page at the beginning of the book that lists the title, author, illustrator, and publisher. Author-The person who writes the story. Illustrator-The person who draws the pictures in the book. Story Text-the words that tell the story. Illustrations-the art that helps to tell the story. Spine-The part that holds the book together and faces outward when the book is on the shelf. 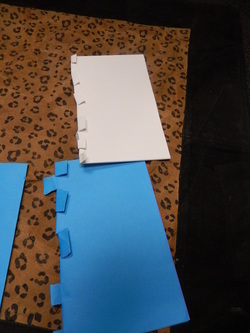 You can make so many different books out of file folders. This file folder book is about "What we are doing at school" This is something you can use during conferences, or just to put in the book center so children can look at it. Children love looking at pictures of themselves and of classmates. If children use this book, remember to laminate. 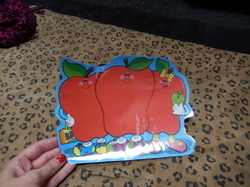 This file folder is about Classroom Friends! Always take pictures of children the first week of school, so you can make projects like this. This book gives a clue on the top of the file folder about who is below under the flap. Glue a picture to the bottom part, children will spend hours looking through this book, and guessing the clues about their friends. This s a book I used either after we would visit the zoo, or read zoo books. You can do this with ANYTHING you are studying! Be creative! This book was also showcasing positional words such as 1st, 2nd, 3rd and so on. The flap on the other side of the file folder has a piece of velcro, and has what we saw first. There is a clue on the left. The last picture is what we saw first! This can be made out of a file folder, on this one I just used paper. It is interactive book for children to participate with during the singing or reading. I am only showing a few pages, but you can see it is a song about the different coins. I got the big coins at Dollar Tree. There is a piece of velcro on each page. The children must match the coins from pocket on the back page. 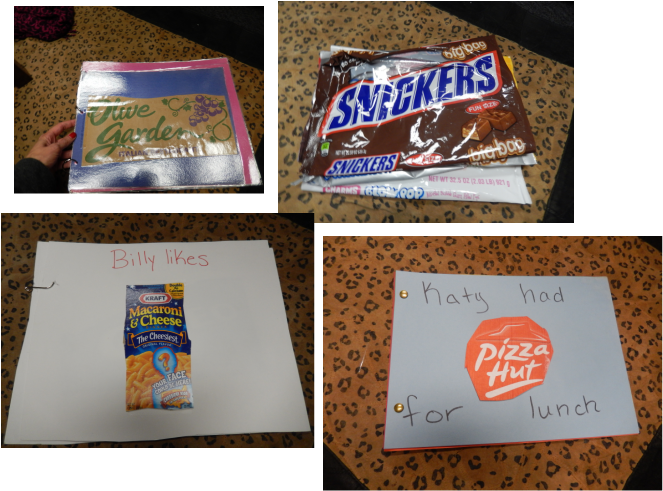 This is just an example of how to reuse lamination! I hate throwing it away, I feel like I need to be using it :). We study spiders around Halloween, at Dollar Tree you can buy spiders in MANY colors. So I just stapled lamination to strong construction paper, and put the color of the spider they should match. This helps with word recognition and color identification. These books are interactive in many ways. I always have a book I read them, and then there is the interactive book to go with it. You can make these up on your own. Find old bulletin board shapes, notepads etc. 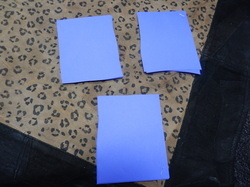 Then you use large poster board laminate, color, and velcro your pieces. There are also interactive book ideas on the internet. These are from fun teacher notepads. You can laminate and have the children use them over and over again, or just let them write on them. You can do these by themes depending on what you are doing in your classroom. Baggie books are so much fun, and be used in the bathtub. I would put skills for my students to work on, or sight words etc. Parents can't say we don't have time! I say, I send home baggie books! 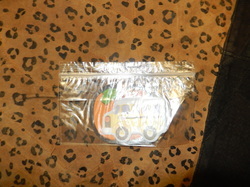 This picture isn't the best, but you take any size of baggie, and make sure you staple outside where you seal so water doesn't get in! Books to Make with your students! This is a graduated book. You will need several sheets of paper. Lay the colors out going up. Fold the paper over either way, it will look different both ways you fold it! This is a necklace book. You can work on whatever skill you want. 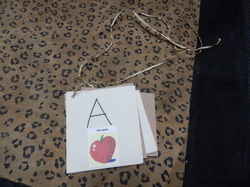 This is an example of an alphabet book. Punch a hole in the top and students can wear it! FOUR BOOKS- Take however many sheets of paper you want and stack them. Staple at ever corner. Cut down the center (leaves you with 2 halves). Cut those in half. Then you have made 4 books. This picture only shows 3 of the four! 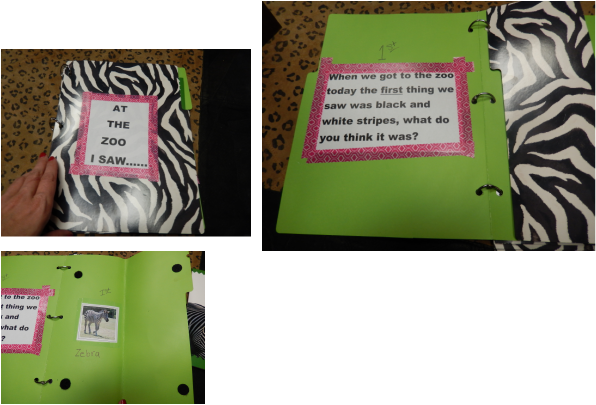 Flip book--You can use this book for any skill, sight words, numbers, adding, etc. This book shows letter recognition, with a picture under that starts with that letter! Fold a piece of paper HOTDOG. Cut or tear slits more than half way up from the open part (opposite the fold). Anytime you find anything that you think would make a good book buy it! OR dig it out of the trash :). 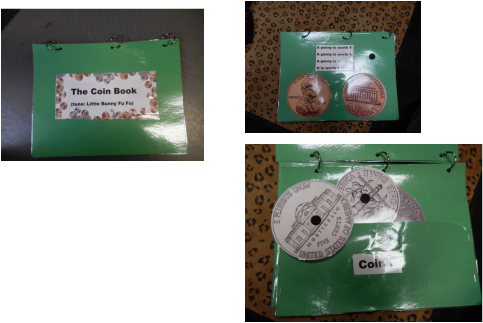 These are LARGE coins and dollar bills, you can make an interactive book, or just bound it, and let children go through them. This is a person book. I found a book I really enjoyed reading to the students and made him! The book is on his tummy. 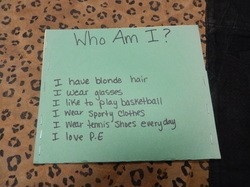 Who am I book--This book is made from construction paper, and is stapled down the left hand side so that many pages can be made. YOu can use this to introduce student of the week, classroom friends etc. You can also do WHAT AM I? For a concept you are teaching such as a circle, or color etc. 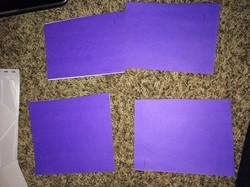 Take a piece of construction paper and fold the bottom up and staple the sides. You put the clue on the outside and a picture on the inside. Card book-We all have a deck of cards that are missing a few! 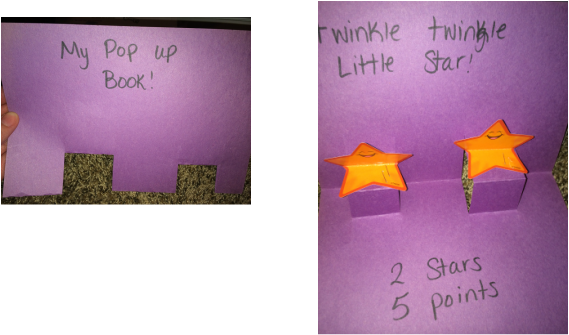 :) Make books, let students review numbers, practice writing, and finding shapes! These books are so fun, and students love them! These are fun, CHEAP paper plates from Hobby Lobby. They had all sorts of animals. You can write stories, or name the animals, name them etc. On the pig one, LIKE was our sight word. 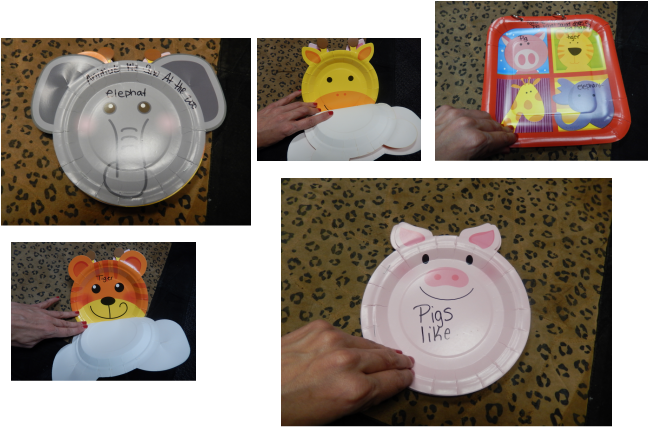 So we did a pig paper plate book, and put words of what pigs like. These are just examples, there are so many fun plates out there. You can choose and use any napkin you want. 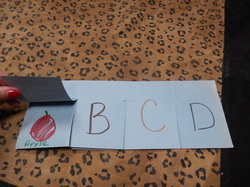 On blank napkins you can do sight words, numbers books, counting, spelling etc. Do anything you want to do. 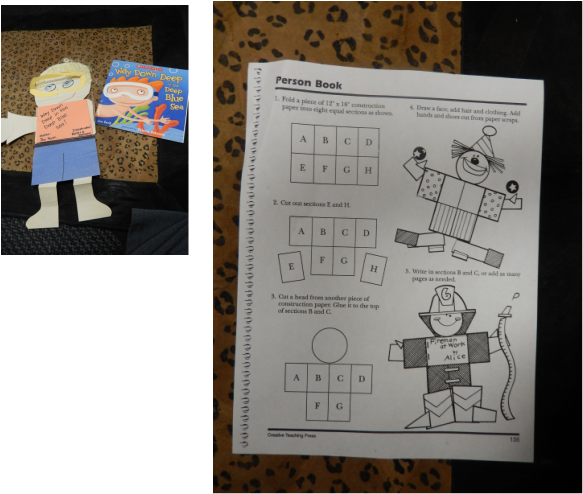 They are really fun for students to make! 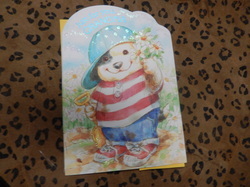 Everyone receives and gives cards! Start keeping the front of the cards! You cut the front off, and staple construction paper behind the card. Students can write stories, draw pictures etc. 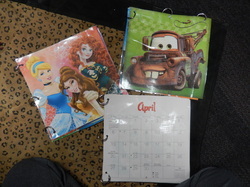 Take old calendars, tear them apart, laminate the pictures and bound them. You can use dry erase markers on them. You can practice numbers in the boxes, you can write on the pages, or students can just name the pictures they know, like they are reading. The teacher and the children collect environmental print. The teacher puts the books together in several ways, as shown. You can have children bring their favorite thing to eat and incorporate sight words such as LIKE, or talk about what they had for lunch etc. Children can identify and read environmental print! Gift sacks! 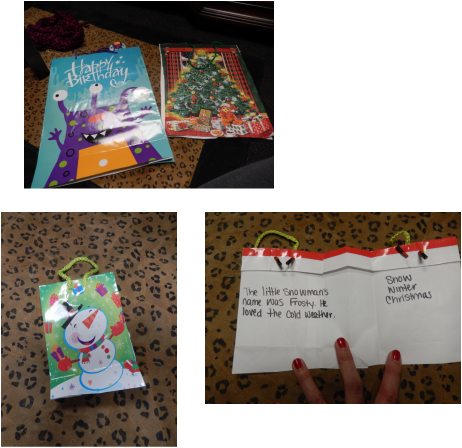 Use old gift sacks you receive to make a book. Most of them even have handles, so children can even carry the book! 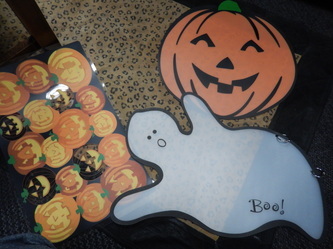 You can cut the middle out and add paper, or use the inside of the sack. This book was a very important part of my classroom. I read it to my students on the first day of school, and it was in my library center for the rest of the year. Children looked through it everyday. I even got really great gifts because of this book! It told everything about me, and what I liked, with real pictures of me and my family. At the end of holidays is the best time to collect placemats of all kinds. Children can write on plastic placemats with a dry erase marker. They are very fun to put in your writing center. 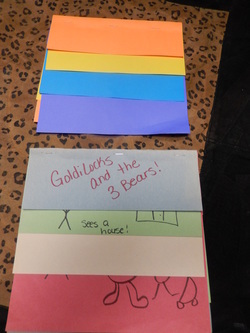 Here are several ideas on how to make a book from old classroom materials. This is a boy/girl book, you could do at the beginning of the year. This book is EVERYTHING fall, you could do this for all seasons. Make sure to make the paper fit the back of the shape. When making these books you must cut on the fold. You can make the book however you want once you do that. These lunch sack books are so easy to make and you can do just about anything you want with them. You can teach any skills and even store items in the slit of the sack. Cut template. Put whatever you are studying in the middle: for example spiders. Put a fact about spiders on each tab. Fold them down. As you read the facts you can guess what is in the middle. Take a regular sheet of typing paper. Fold the bottom to the middle. Fold the two top edges towards the middle (to a point) like the one on the left. It will look correct like the one on the right. It is a house. I used this activity for many thing such as fact families, literacy activities, but for my young children we actually made it a house with their full name, address, phone number, parents name etc. Anything they were going to be tested on for the report card. lay about 4-5 sheets of paper on top of one another. Staple all four corners. Cut cross ways down the middle and you have 4 tiny books.